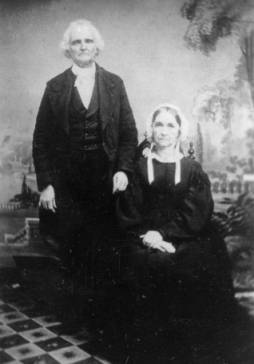 John and Jane Rankin, 1872. John Rankin was a Presbyterian minister and a prominent member of the Underground Railroad network that assisted fugitives from slavery in the years before the American Civil War. Rankin was born on February 4, 1793, in Tennessee. He attended Washington College in Virginia, and became a minister in the Presbyterian Church. Rankin dedicated his life to abolishing slavery in America. In 1818, Rankin formed an anti-slavery society in Carlisle, Kentucky. Slavery was legal in Kentucky and Rankin was criticized for his views. He eventually moved to Ripley, Ohio. Slavery was illegal in Ohio. While many Ohioans opposed the ending of slavery, the people of the state were generally more receptive to abolitionists than their neighbors in Kentucky. In Ripley, Rankin served as a "conductor" on the Underground Railroad and opened his home to African Americans seeking freedom. His home stood on a three hundred-foot high hill that overlooked the Ohio River. Rankin would signal fugitive slaves in Kentucky with a lantern, letting them know when it was safe for them to cross the river. He kept the runaways hidden until it was safe for them to travel further north. The United States Constitution and the Fugitive Slave Law of 1850 permitted slave owners to reclaim fugitive slaves, even if the African Americans resided in a free state like Ohio. To truly gain their freedom, runaways had to leave the United States. Underground Railroad stops provided runaway slaves with safe houses all of the way to Canada. Rankin gave shelter and food to as many as two thousand runaway slaves during his career with the Underground Railroad. Harriet Beecher Stowe immortalized Rankin's efforts to help African Americans in her book, Uncle Tom's Cabin. Rankin's home was the first stop in Ohio for Eliza, one of the book's main characters, as she sought freedom in the North. Rankin spent most of his life in Ohio as a Presbyterian minister. He helped establish the Free Presbyterian Church of America, which prohibited slave owners from becoming members. Rankin also helped form an anti-slavery society in New York and established the Ohio Anti-Slavery Society in 1835. In 1829, he established Ripley College. At its peak, the college had 250 students. In 1831, Rankin enrolled the first African-American student in the school. Many of the college's students came from Kentucky and did not share Rankin's abolitionist views. Some students left Ripley College and did not return. Rankin also lectured across the North for the American Anti-Slavery Society. He was often the victim of mob violence. Rankin died on March 18, 1886, in Ironton, Ohio. Hagedorn, Ann. Beyond the River: The Untold Story of the Heroes of the Underground Railroad. New York, NY: Simon & Schuster, 2002.